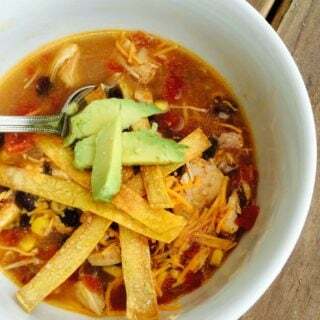 Buffalo chicken chili has everything you love about Buffalo chicken wings, without the sticky fingers! 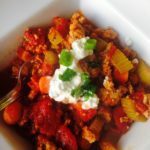 This ground chicken chili has some spicy heat, but it’s cooled down with Greek yogurt and blue cheese crumbles. 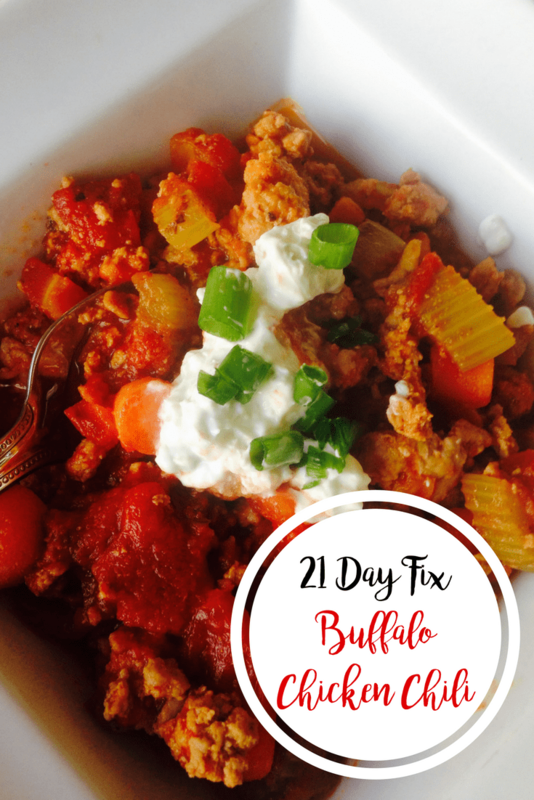 Even better news is that it is a 21 Day Fix approved recipe! Confession #37 – I have a major weakness for chicken wings. And blue cheese. Oh how I love a good blue cheese dressing. In college, I worked happy hour Fridays at our local bar and made wings in the basement with the owner’s wife. There was a lot of sampling going on in that kitchen. A 20 year-old’s metabolism is a beautiful thing. So, now, since I know how much sugar, butter, and oil go into making chicken wings, I have found other ways to get my fix. 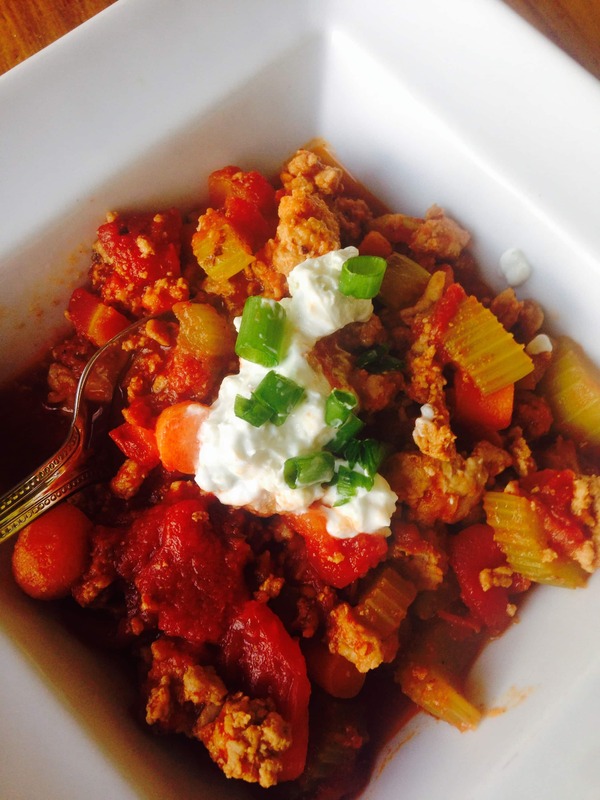 Like in this Buffalo Chicken Chili one-pot meal. It’s a great way to get the flavor of your favorite wings without the extra calories and unhealthy fat. 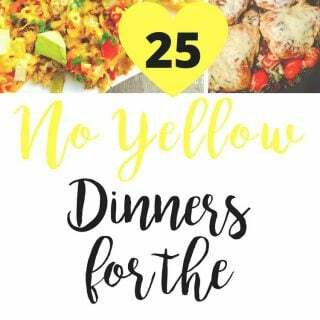 This recipe is adapted from The Today Show’s Joy Fit Club. The original recipe is pretty healthy, but it calls for tomato or vegetable juice which often has added sugar. It also calls for white flour, which I have tried to do without while on the fix. My version was just as yummy, but I used diced tomatoes instead and nixed the flour. A total winner; both my husband and my one year old gobbled it up. It’s a good thing that they saved some Buffalo chicken chili for me. Coat a large pot or Dutch oven with cooking spray, and preheat it over medium-high heat. Add the carrots, celery, and onion; saute until tender (about ten minutes.) 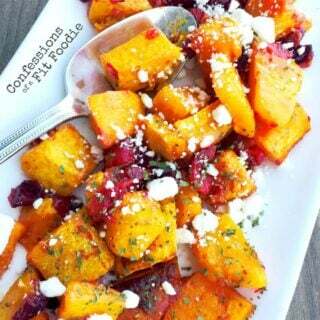 If necessary, add a tablespoon or two of water to prevent scorching. Add the garlic and sauté for 1 minute. Add the ground chicken, reapplying cooking spray if necessary. Sauté, stirring continuously and breaking the chicken into small pieces, for 5 minutes or until cooked through. Pour tomatoes in a blender and pulse a few times so the texture is more like a chunky tomato juice. Measure out 2 cups of the tomatoes and combine with hot sauce and chili powder to taste. Stir mixture into chicken and veggies. If you need more tomatoes or seasoning, add it little by little. The chili will thicken a bit once cooked. Freeze extra tomatoes – you can use it in veggie soup! Reduce heat to low and simmer, partially covered, stirring occasionally, for about 15 minutes. Meanwhile, mix the blue cheese crumbles with the Greek yogurt for the topping. This serves 3 to 4 people (depending on the amount of meat), so ladle equally into bowls and top with blue cheese yogurt and chives. I ❤️ hearing from you, so keep those comments coming! You are the best!! I love your recipes and how “real” you are. A true inspiration on a relatable level!! Thank you!! HI – what do you count the yogart towards? Is that part of the red container? It’s such a little amount divided into four containers, so I don’t count it. If you do, it would be red. If I sauted the chicken in Instant Pot and then threw all other ingredients in it, what setting and for how long would you recommend? Is there something I could sub for the yogurt? Thank you, Meghan! Same here! Last night I commented on how much my husband and I loved the sausage cauliflower casserole (fighting over leftovers) … and tonight we made this! Oh. My. Goodness. I cannot believe how incredible this recipe is. The topping alone I could eat on ANYTHING!! We absolutely loved it. I’ve already shared it with multiple people. Thank you!!! For the time and effort you put in to give us something healthy and oh-so-yummy!! 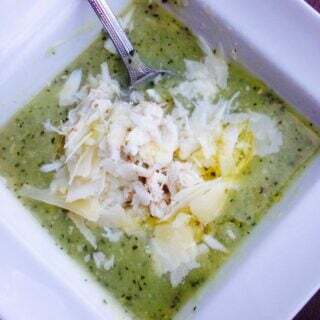 My Instant Pot arrives tomorrow- so we made this on the stove and loved it. Keep it up girlie- you are SLAYING it!!! Ahhh! You have no idea how this means to me – thank you, thank you, thank you for taking the time to write! And congrats on the Instant Pot purchase – you are gonna LOVE it! Let me know what you decide to make first!